View More In Medical Supplies & Equipment - Page 2. The new Drive Medical Folding Universal Sliding Transfer Bench offers easy entry into and out of the bathtub. The bench slides left and right along the frame and comes equipped with a seat belt for added safety. Simply place the Drive Medical transfer bench in the shower/bath area and it is ready to use. Durable construction and wipe down cleaning make this device an easy-to-care-for safety piece. The folding transfer bench can help anyone who needs bath support maintain their independence. The chair folds up easily when not in use and requires minimal storage space. 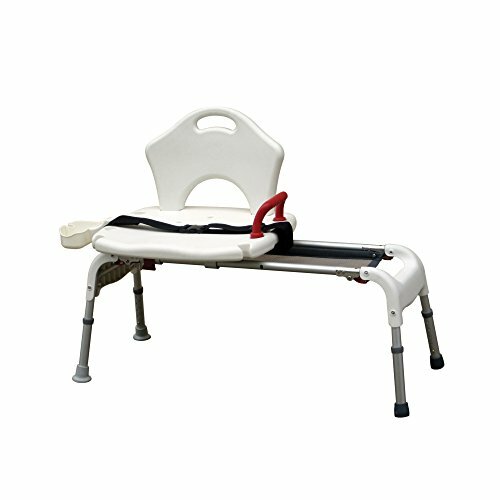 The Drive Medical Folding Universal Sliding Transfer Bench provides a lightweight seating solution for all bathing needs. Drive Medical Bariatric Heavy Duty Transport Wheelchair with Swing-away Footrest, Blue, 20"
Drive Medical Sentra EC Heavy Duty Wheelchair with Various Arm Styles and Front Rigging Options, Black, Bariatric 24"